One in three homes in the UK have solid walls, most of which can’t be fitted with external insulation for either practical or planning reasons. Yet installing internal wall insulation is expensive and disruptive for residents. Sustainable Energy Academy has teamed up with social housing contractor and developer United House to offer a safe, low-fuss measurement and installation process allowing solid-walled properties to be to be insulated quickly and affordably. Using laser scanning and other standard technologies in a novel way reduces costs by over a fifth. And with rooms insulated in a matter of hours, residents don’t even have to move out. Insulating our homes so they use less energy is key to tackling fuel poverty and reducing the UK’s CO2 emissions. 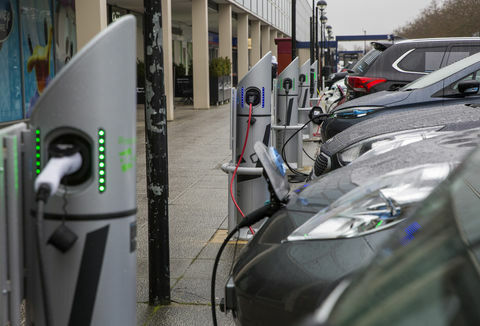 This is a giant leap forward in a key area of energy efficiency, with huge potential to extend beyond social housing to the private sector to make our building stock fit for a low-carbon future. 7.9 million UK homes, about 29% of the housing stock, have solid walls and so require above average amounts of energy to heat them. Solid walls can be internally or externally insulated, but only 2% (153,000) of solid walled homes had insulation installed as of April 2012. External solid wall insulation is seen as expensive, and it is not possible to install it in about 60% of cases due to the construction of the building or planning restrictions. Internal insulation is somewhat cheaper, but installation causes significant disruption to the household, requiring them to vacate their home. Sustainable Energy Academy (SEA) and United House have worked together to develop the WHISCERS™ process (Whole House In-Situ Carbon and Energy Reduction Solution) that allows internal wall insulation to be installed in a single day with minimal disruption and reduced cost. Most importantly, the occupants do not need to move out during the installation. SEA was founded in 2003, and its previous major achievement was the SuperHomes network, which won an Ashden Award in 2009. Building on that experience, SEA developed WHISCERS™ and looked for a partner organisation with which it could commercialise the process, eventually selecting United House. United House was founded in 1964 as Harp Heating, changing its name in 1989 to reflect the change in its business activities to include all aspects of refurbishment and construction of both social and private housing. United House is known for its efficient approach to logistics, making it ideal to take on and refine the WHISCERS™ process. SEA employs six people, some of them part-time, and one is involved in the WHISCERS™ project. SEA’s 2012-13 turnover was £100,000. United House employs 450 staff and 3-4,000 contractors, with nine working on WHISCERS™, and had a 2012-13 turnover of about £250 million. United House is the sole licensed installer and markets WHISCERS™ as a service to social landlords, including local councils and housing associations. Installations are carried out by Proteam, a sub-contractor used by United House on a regular basis. The biggest thing for us was that we didn’t have to move out. All the furniture stayed more or less where it was - and if we had to move things at all, the builders helped. As the inventor of the WHISCERS™ system, SEA is paid a small fee per installation by United House. In return, SEA continues to assist United House with development and refinement of the system, and once the fees paid reach a total of £300,000, SEA will transfer ownership of the WHISCERS™ patent to United House. 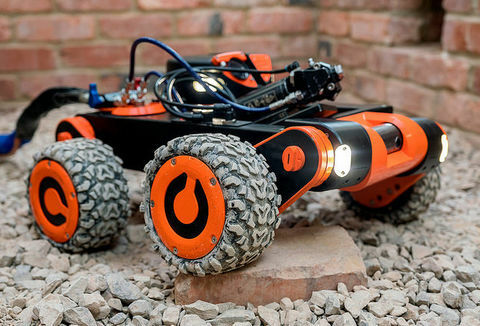 A laser measurement device is used to survey the walls to be insulated to an accuracy of better than 1mm. This can take as little as 10 minutes per room, depending on whether any furniture needs to be moved to get a clear view of the wall. The measurement device can be mounted on a tripod, or to save time can simply be placed on any flat surface, such as a table. The data resulting from the laser survey is downloaded to a factory where a computer program optimises the size and shape of insulation panels required for easy installation, including allowing for windows, power sockets, etc. The insulation used is Kingspan Kooltherm K18, which is a rigid phenolic foam board with plasterboard laminated on the front and a reflective foil backing, with a total thickness of 62.5mm. The insulation is supplied as large boards, so several panels can be cut from a single board using a computer-controlled router. Because the system is computerised, panels destined for different houses can be cut from the same insulation board, and wastage is therefore minimised. The debris produced during cutting is collected to be recycled into new products. The panels are delivered for installation in packs, with each panel labelled to indicate the house, room and position on the wall where it should be installed. Because the panels have been cut to convenient sizes, they can easily be carried into a house by one person without damaging any walls or furniture. The panels are installed on top of a damp-proof membrane, with any essential electrical and heating work carried out at the same time. A plaster skim is applied on top of the installed panels to hide the joins, and is ready for decorating the following day. Installation takes one person about 1.5 hours per room, so a whole house can be completed in a day. For social landlords, a significant additional saving comes from the fact that insulation can be installed while tenants remain in their homes. With traditional internal wall insulation, the tenants must be ‘decanted’ to a vacant property while the work is carried out. These decanting costs, which include removal services, loss of rent, postal redirection and tenant liaison, can amount to £2-4,000, so avoiding this cost is a major selling point for WHISCERS™. The Kingspan boards that are used in the WHISCERS™ process are manufactured in the UK, and the process of cutting them into panels for installation is carried out by a United House sub-contractor in Surrey. Careful installation of the panels and the damp-proof membrane is essential to achieve good performance from the insulation and to avoid damp problems. Installers therefore attend a five-day training course run by Kingspan and then work alongside an experienced installer for the first few weeks before being approved for working on their own. 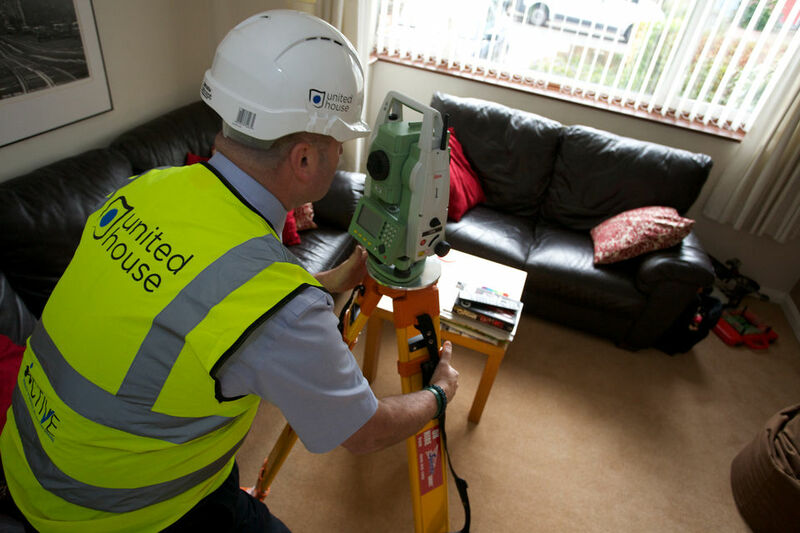 Surveyors receive three days’ training to ensure they can capture the required data from properties accurately and quickly. Safety is a key selling point of WHISCERS™, as this is one of the aspects that makes it possible for installation to proceed without the household moving out. 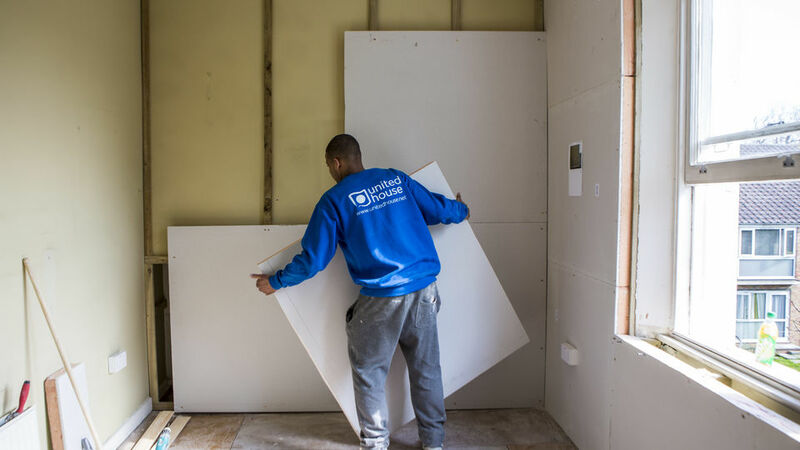 Because the boards are cut into panels off-site, there is no use of potentially dangerous tools during installation, which is especially important if children are present at the house. After installation and redecoration, no further maintenance is required and the lifetime should be in excess of 40 years. 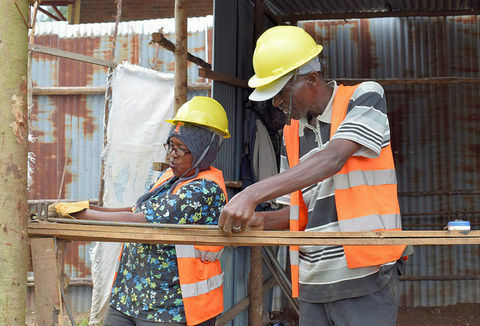 Concerns are sometimes raised about the risk of condensation after installing insulation, so SEA contracted Parity Projects (a 2012 Ashden Award-winner) to carry out monitoring of selected WHISCERS™ installations to check whether there are any problems, and none have been found. The WHISCERS™ process has been in development and testing for three years, and a patent has been granted. So far there have been 170 installations of WHISCERS™, including three early pilots. People look up at a tower block and say it can’t be done. I tell them it can - and what’s more, that using the WHISCERS™ method will be cheaper, faster and easier than exterior wall insulation. Installing WHISCERS™ can reduce energy use for space heating by around 40%, or 10 MWh per year for a typical 3-bedroom semi-detached solid walled house. If the property has gas central heating, this saves about 1.9 tonnes/year of CO2. The WHISCERS™ installations carried out so far are therefore saving about 280 tonnes CO2 per year. 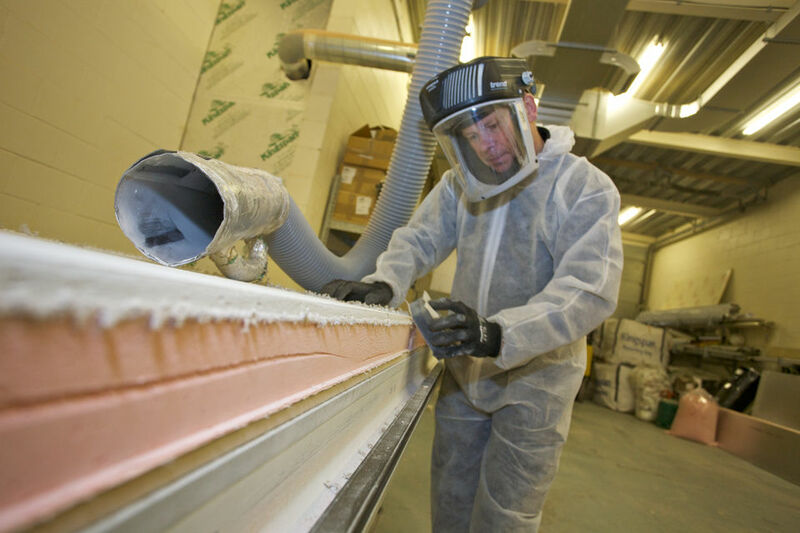 The use of off-site cutting of insulation panels from larger boards delivers environmental benefits by reducing wasted board area to just 10%. Because the leftover materials are at the cutting factory, they are all recycled. The main benefit for households receiving WHISCERS™ installations is a reduction in the cost of energy required to heat their homes. Because solid-walled homes are expensive to heat, the 40% cut in energy used for space heating can result in a saving of £400 a year at 2012/13 gas prices, or £600 if electric storage heaters are in use. Some households will have been under-heating their homes due to financial difficulties, so adding insulation will improve their comfort and also health in some cases. The money-saving benefits of WHISCERS™ can also be delivered by traditional internal wall insulation, but at the cost of significant disruption as the household has to relocate while the work is done. By removing this barrier, and cutting installation costs, WHISCERS™ can bring these benefits to many more households. Solid walls are one of the most important elements of heat loss from a house, and WHISCERS™ is making it possible to tackle them at a reasonable cost. WHISCERS™ is supporting six permanent jobs in the supply chain, and a similar number of installer apprentices have been trained so far. Temporary support staff are also required during installation, and United House employs people local to the installation site for these jobs, and helps them to acquire new skills and experience which will make them more employable afterwards. SEA and United House are continuing to refine the WHISCERS™ process, with the aim of reducing installation time and costs still further. Several pilots with local councils and housing associations are in progress, and the work is expected to expand rapidly in the coming years. The Kingspan boards used in WHISCERS™ are already approved for ECO and the Green Deal, and grants or loans from these sources are expected to boost demand from private households; United House is already looking into how WHISCERS™ could be delivered at a reasonable cost outside the social housing sector. We’ve always been quite green and frugal with energy use, but it was a large cold house, and we’d done all we could. Getting the house retrofitted with WHISCERS™ was great! Our winter gas bill has reduced from about £660 to £230, and the children say they like coming home to a warm house. Nationally, there is huge potential for WHISCERS™, with 7.8 million uninsulated solid-walled homes, and United House aims to be installing the insulation in 10,000 properties per year by 2016. On top of these are a further 3.6 million homes with cavity walls that are regarded as ‘hard to fill’, due to a range of reasons including narrow or irregular cavities, lack of access and damp problems. These homes could potentially benefit from WHISCERS™, as it would be unaffected by the factors preventing their cavity walls being filled. The use of WHISCERS™ is not limited to the UK – through the Technology Strategy Board, SEA and United House are already working with universities in Austria and Greece to trail the system, with the goal in Greece being to keep houses cool rather than warm. French and Belgian universities are also participating in trials of WHISCERS™, making this a truly international product.